The Library has a trial of Indian Claims Insight until May 10, 2019. 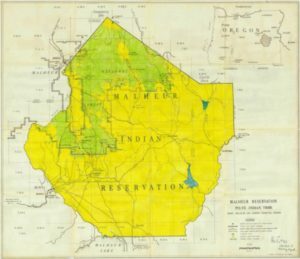 This resource provides researchers with the opportunity to understand and analyze Native American migration and resettlement throughout U.S. history, as well as U.S. Government Indian removal policies and subsequent actions to address Native American claims against the U.S. Government. The collection includes docket materials for all Indian Claims Commission cases, as well as cases that preceded and followed the existence of the commission. Coastal Tales: The Long Struggle to Preserve California’s Coast – New Podcast Just Launched! In 1972, the citizens of California voted overwhelmingly to create a new agency charged with regulating all development along the state’s coastline, an agency that became known as the California Coastal Commission. For nearly 50 years, the Commission has worked with coastal communities to shape development along California’s shore, efforts guided by the dual aims of environmental protection and public access. It is often said that the true history of the Coastal Commission is what you don’t see, namely the developments along the coast the agency either denied or significantly scaled back. This “unseen” history stands at the heart of the 15-episode podcast, Coastal Tales: The Long Struggle to Preserve California’s Coast, a production of the Oral History Center at UC Berkeley in partnership with the Bill Lane Center for the American West at Stanford University. 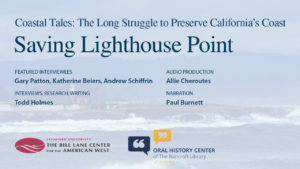 We’ve just launched the pilot episode about saving Lighthouse Point in Santa Cruz, and the rest of the podcast is slated to be released in the fall of 2020. The pilot episode, “Saving Lighthouse Point,” tells the story of the fight in Santa Cruz during the early 1970s against massive development that sought to turn one of the city’s last open parcels of coastal land into a bustling tourist and business hub. Bolstered by the creation of the Coastal Commission, the citizens of Santa Cruz organized and challenged the city council’s support of the project, ultimately saving Lighthouse Point. The successful campaign not only came to stand as a testament to the Coastal Commission and its influence in many coastal communities, but also would prove a watershed moment in the history of Santa Cruz. Each episode of the podcast will feature a specific site on the state’s coastline and detail the story of a proposed development that, if not for the Coastal Commission, would have significantly altered those sites and communities forever. Led by Todd Holmes, a historian at the Oral History Center and affiliated scholar with Stanford’s Bill Lane Center, the podcast draws on oral history interviews currently underway with former staff and commissioners of the agency, as well as community activists closely involved with the Commission over the decades. The project also draws on Holmes’ research conducted with the California Coastal Commission Project, which the Bill Lane Center initiated in 2014. When complete, the 15 episodes of Coastal Tales will be housed on a dedicated website that will feature the full transcripts of the interviews along with additional information and resources on the history of the Commission. The public will also eventually be able to access the episodes at the sites themselves with the scan of a QR code. If you’d like to learn more about this project, please contact Todd Holmes at todd.holmes@berkeley.edu or 510-666-3687. You can also support our future episodes by writing California Coastal Commission in the special instructions section of the donation form. Listen to the pilot episode, read the oral histories, and and be sure to stay tuned for more information! A trial of Apartheid through the eyes of South African political parties is available through April 19th. User feedback is greatly appreciated. 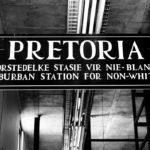 About the collection: Apartheid was a system of white minority rule that prevailed in South Africa for much of the 20th century. This collection contains various materials published by political parties on both sides of the racial and ideological divide. The bulk of the documents are drawn from the archives of the main opposition movement, the African National Congress (ANC). The main party of government, the National Party, is also well represented, as are several minor parties and independent candidates. New Deal and World War II: President Franklin D. Roosevelt’s Office Files and Records of Federal Agencies (1933-1945) includes materials deemed especially important by the President on the basis of content and source. Major topics covered in the files are the Great Depression, the New Deal, America’s involvement in World War II, the internal workings of the Roosevelt administration, and Roosevelt’s personal leadership style. Several additional collections include the FBI Reports of the Franklin D. Roosevelt White House; Civilian Conservation Corps Press Releases; Department of Treasury records; and a special set of documentary records on the Roosevelt Presidency covering 50 important episodes and themes of the Roosevelt presidency. Of particular interest are the Records of the Committee on Economic Security, an advisory board tasked by the President to propose measures that would ensure economic security for Americans. It’s final report was the blueprint for what would become the Social Security Act. 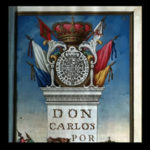 The Biblioteca Digital Mexicana is a multi-institutional initiative to create a digital collection of historical documents from Mexico from 500 A.D. to 1949. The documents range from pre-hispanic codices such as the Mixtec Codice Colombino from the 12th century, to the original manuscript of the Plan de Ayala written in 1911 by Emiliano Zapata and Otilio Montano, one of the most important documents of the Mexican Revolution. This resource allows for two simultaneous users. If you are having trouble accessing the content, please try again another time. The Library has a trial for Fire Insurance Maps Online (FIMo) through February 28. The trial is set up for access on campus but not via EZProxy so you will need to be on campus or use the VPN to access the resource. 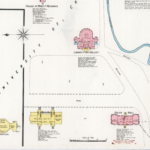 Fire insurance maps were originally created to assist fire insurance companies with assessing their liability in urban areas. They contain detailed information about properties and individual buildings. Go to https://fims.historicalinfo.com Use the interactive map search or search by place name. During the trial you can search and view historical map coverage throughout the U.S., but will not be able to download full resolution imagery. We are happy to present a guest posting by researcher E. Rafael Perez, who shares his experience viewing original photographic negatives in the Bancroft reading room. Negatives, often with no matching prints extant, are made available by appointment with a week’s notice. Researchers may make their own reference snapshots for personal study, as illustrated below, and may place photo orders for high quality digital imaging of selected items. Since being acquired by the Bancroft Library, the Eldridge Cleaver Papers have given scholars a glimpse into his eclectic experiences. Spanning his early days as Minister of Information for the Black Panther Party, continuing into his time in exile as head of the Black Panther Party’s International Section, and following right on through to his eventual return to the United States—after which he served time in prison, became a born-again Christian and made appearances in support of the Republican Party—the Cleaver Papers and the Eldridge Cleaver Photograph Collection provide context into a complex and layered life. The rarely-seen photographic negatives found in the Eldridge Cleaver Photograph Collection provide consequential traces of life events not covered by other parts of the collection. For the uninitiated, photographic negatives are the in-camera originals of 20th century photography, in the form of sheets or strips of film in which the darkest areas of a photographed subject appear lightest and the lightest appear darkest. At the Bancroft Library, negatives are stored at 40 degrees Fahrenheit and 30 percent relative humidity. Interested parties make an appointment ahead of time to schedule a viewing, as negatives must spend some time acclimatizing before use. This process highlights archivists’ challenge of balancing the best practices of presentation to the researcher and the best methods of preservation. Nevertheless, examining the over 480 35-millimeter negatives of the Eldridge Cleaver Photograph Collection provides fertile ground for historical exploration. In 1970 Eldridge and Kathleen Cleaver traveled to North Korea, in part because Eldridge had helped organize the United States Anti-Imperialist Delegation. The delegation traveled between North Korea, China, the USSR, and Vietnam in search of models of self-sufficiency during the Cold War. The delegation consisted of representatives from various political and media organizations. (A full list of delegation participants is available online via the Wilson Center.) At the time, North Korea sought to project itself as a model for postcolonial development to the decolonizing world. Cleaver’s own disillusionment with this vision of North Korea would not come until later, a shift that is also covered in the Cleaver Papers. While some may believe the photographic negatives to be the unfinished and inconvenient templates of the photograph collection, the negatives provide more possibilities for analysis through their many unprinted strips. 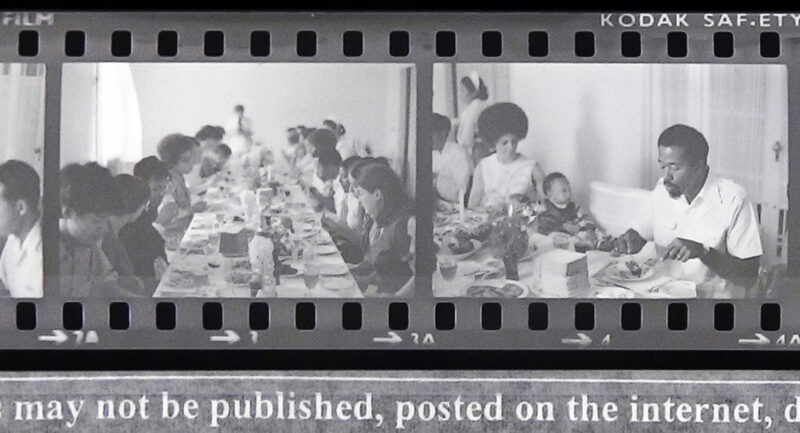 One example of the usefulness of the Cleaver negatives is a series, reproduced in part here, that depicts a birthday party held for Kathleen and Eldridge Cleaver’s son Maceo. The negatives provide an intimate portrait of the event, as the family is flanked by Korean and American attendees. Though these photographs were apparently not printed by Cleaver, we see through them a new thread of information that helps us piece together the visual history of Cleaver’s travels and, more broadly, the exchanges between the Black Panther Party’s International Section and solidarity movements among nations of Asia, Africa, and Latin America. 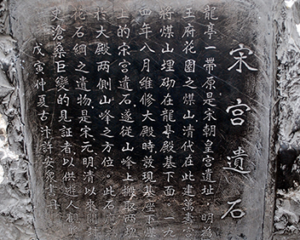 Rather than using images to simply supplement textual evidence in historical writing, this instance reveals the possibilities for expanding narratives through visual histories. How might we more frequently incorporate the use of photography in its rawest and least edited form—the negative—as a source in the study of history? How might we seek to incorporate visual resources into narratives while still maintaining a critical lens regarding these events? To begin to answer these questions as a community, researchers might begin to look for similar threads within their own source bases. Bloom, Joshua and Waldo E. Martin. Black Against Empire: The History and the Politics of the Black Panther Party. Berkeley: University of California Press, c2013. Malloy, Sean. Out of Oakland: Black Panther Party Internationalism During the Cold War. Ithaca: Cornell University Press, 2017. Wu, Judy Tzu-Chun. Radicals on the Road: Internationalism, Orientalism, and Feminism during the Vietnam Era. Ithaca: Cornell University Press, 2013. Young, Benjamin. “Juche in the United States: The Black Panther Party’s Relations with North Korea, 1969-1971.” In The Asia-Pacific Journal, Vol. 13, Issue 12, No. 2, March 30, 2015. E. Rafael Perez is a PhD Candidate in the Department of History at the University of Chicago. He is a recipient of the 2018 Mellon Fellowships for Dissertation Research in Original Sources, administered by the Council on Library and Information Resources (CLIR). For more recommendations that reflect the recent rise of rigorous historical research related to the Black Panther International Section, please contact him at erp1[at]uchicago.edu. 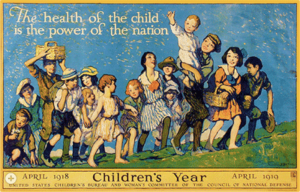 The Library has recently acquired Records of the Children’s Bureau, 1912-1969, which consists of reports, speeches, correspondence, and research materials from the Children’s Bureau, the first federal agency dedicated entirely to protecting the welfare of children and families. The documents in this collection span the years from its creation in 1912 through 1969 and originate from the administrative files of bureau staff members, including the bureau’s chiefs throughout the years: Julia Lathrop, Grace Abbott, Katharine Lenroot, Martha Eliot, and Katherine Oettinger. 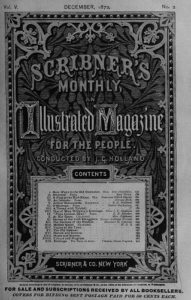 The Library recently acquired the complete digital archive of the historical periodicals held by the American Antiquarian Society (AAS). The collection exists as a series of five databases created from 6500 American periodicals published between 1691 and 1876. The collection also contains titles in more than two dozen languages including French, German, Norwegian, Spanish, and more. The series can be searched together or individually.